A cute little romantic comedy about a woman who is new in town and finds the locals to be hostile until she starts introducing them to new things. Chocolat is a nice romantic comedy about a town of eccentric folk and a woman who comes in and shakes up their whole situation. The woman is juliette Binoche, an actress who, like audrey tatou, has been in only a small handful of american films over the last decade or so. She was in the english patient, then this movie, and then dan in real life, with steve carrell. All three were interesting and artistic films. Binoche is clearly an actress who chooses her roles carefully. And this movie is probably the best out of all of those three. It’s a film by lasse halstrom, the swedish director who was coming off his oscar nominated cider house rules. 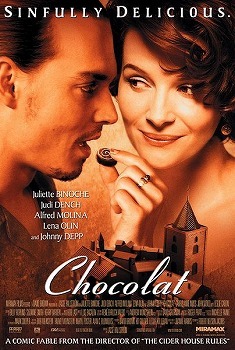 That movie was up for best picture as well as numerous other categories, and Chocolat followed in it’s footsteps. 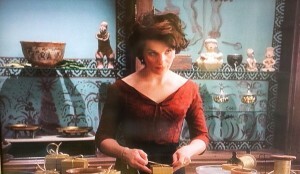 It received a best picture nomination as well as acting noms for Binoche and also judi dench. And the movie deserved all the attention that it received. There have been plenty of films or stories about mysterious strangers coming to town and Affecting the people, but usually it’s in a negative way. This woman, Vianne (Binoche), comes to town and makes everyone and everything a little happier. But not right at first, of course. THe town is very religious with the church at the center of it all and Vianne doesn’t have any interest in partaking in religion at all. She never sets foot inside the church. Aside from that, she’s unmarried with a young child. And aside from that, she opens up a patisserie show, selling Chocolates, which represents a temptation. To make matters worse, she comes to town during lent, when people are supposed to be fasting and giving things up until easter. The idea there is that god gave up his only son. And on top of all that, the movie’s villain, the count (Alfred molina) has self-control and temptation problems of his own. He constantly has a sandwich placed on his desk in front of him to tempt him and i suppose punish him and make him that much tougher and more resistant. But he is certainly someone who looks at sweets and those who would pedal them as the enemy. Binoche makes friends with the locals, little by little. First it’s judi dench as the older woman who rents the place out to her. Dench finds her interesting and unusual as she lives a life where everyday is pretty much the same and life has no surprises left to offer her. Binoche represents something different. And then there’s Josephine as the woman who everyone looks down upon as the town thief. Her husband, Peter Stormare, is a town fool who runs a bar and abuses her. Binoche takes Josephine under her wing, letting her stay with her and her daughter and help run the patisserie. And then there’s carrie anne moss as dench’s daughter who has problems with her mother and refuses to let her young son spend time with the old woman. Binoche finds a way to change that, inviting the boy into the shop without his mother’s knowledge, while his grandmother is also there. This movie is stacked with characters. As if all of these weren’t enough, about halfway in, we meet johny depp as a gypsie drifter, traveling into town by boat. He does some construction work for Vianne and then woos her. This only makes the Count even angrier. The movie is nice, light hearted, and enjoyable, but it is also nothing that fantastically creative or original. Everything works out the way you might expect, with characters learning their lessons and having a change of heart. There is one point toward the end where Vianne plans to leave the town, claiming she’s had enough, and this is where most circular stories would go. She spent her time in the town, and now it’s time for the movie to go back to the way it began. Only this movie breaks the tradition and has other ideas up it’s sleeve. It’s a good movie, full of nice energy and cute little ideas.